1. Use genuine Honda or Honda-recommended parts and lubricants or their equivalents. 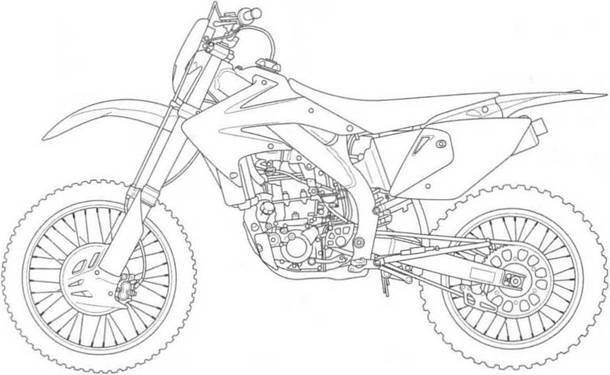 Parts that do not meet Honda’s design specifications may cause damage to the motorcycle. 2. Use the special tools designed for this product to avoid damage and incorrect assembly. 3. 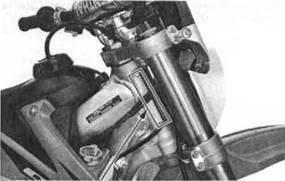 Use only metric tools when servicing the motorcycle. Metric bolts, nuts and screws are not interchangeable with English fastener. 4. Install new gaskets, О-rings, cotter pins, and lock plates when reassembling. 5. When tightening bolts or nuts, begin with the larger diameter or inner bolt first. Then tighten to the specified torque diagonally in incremental steps unless a particular sequence is specified. 6. Clean parts in cleaning solvent upon disassembly. Lubricate any sliding surfaces before reassembly. 7. After reassembly, check all parts for proper installation and operation. 8. Route all electrical wires as shown in the Cable and Harness Routing. The Vehicle Identification Number (V. I.N.) is stamped on the right side of the steering head. 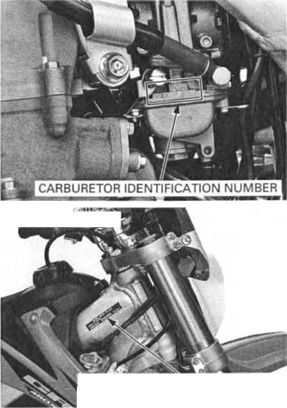 The carburetor identification number is stamped on the left side of the carburetor body.